Depression affects 15 million Americans and is characterized by debilitating feelings of sadness or emptiness that interfere with the ability to lead and enjoy life . The substantial personal and public health burden imposed by depression has motivated decades of intensive research by scientists, clinicians, therapists, and pharmaceutical companies alike, yet the biology underlying the cause (or causes) of the disease and its treatments remains unknown. As a result, the diagnosis of this neuropsychiatric illness is problematic and remains based on clusters of clinical symptoms and subjective self-reporting. Patients diagnosed with major depressive disorder (MDD) experience emotional pain with a severity or a duration that is highly disruptive to their lives; however, the pattern of symptoms varies significantly from patient to patient and between men and women. Some patients have a family history of depression, while others have none. Some depressive episodes appear to be initiated by a traumatic or stressful event, while others do not have an obvious trigger. These clinical observations suggest that depression may be several distinct conditions that have been grouped under one diagnosis on the basis of their shared symptoms . Scientists have identified many physiological changes, or biomarkers, that occur in association with depression. For example, imaging the brains of patients with MDD reveals decreased activity in the analytical prefrontal cortex and increased activity in the emotional limbic system . The electrical activity of the brain as measured by electroencephalography (EEG) is also altered in patients suffering from depression, most notably during the different phases of sleep . Blood tests show that depressed patients have increased levels of molecules called cytokines that promote inflammation, as well as lower levels of molecules called growth factors that regulate the development of new cells, including new brain cells . Frustratingly, not one of these measurements can be used to definitively diagnose an individual with depression due to the overlap between MDD patient and control populations (Figure 1) . We do not know if the different clinical presentations of depression and the observed physiological changes seen in depressive patient populations share a common biological underpinning in part because genetic clues as to the etiology of the disease have remained elusive. 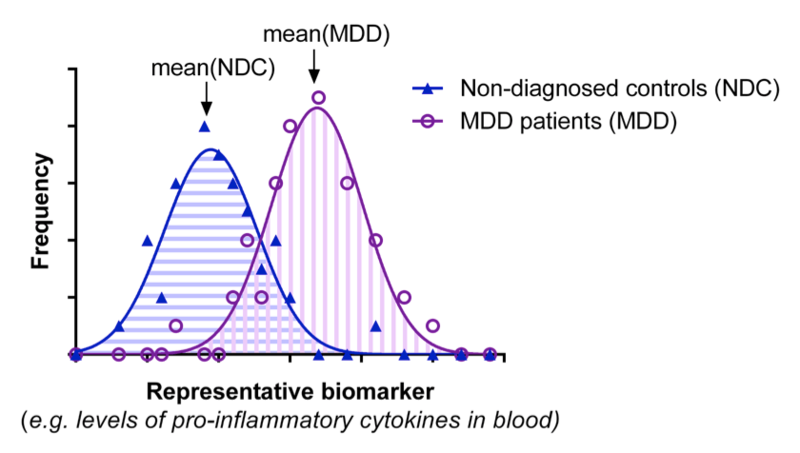 Figure 1: Representative distribution of an MDD biomarker, for example the levels of a pro-inflammatory cytokine in blood samples. The average value of this measurement in patients with MDD, mean(MDD), is greater than the average value for non-diagnosed controls, mean(NDC). However, there is significant overlap between the two populations, so measurement of this biomarker alone is not sufficient to diagnose an individual with MDD. Scientists and clinicians hope to find variations in the DNA sequences of patients with depression, and to leverage such findings to develop diagnostics and treatments for the illness. In 2013, the Psychiatric Genomics Consortium, a massive group of over 800 investigators from 38 countries, reported genetic analyses from 17,000 people with MDD without finding a single genetic change, or variant, that was meaningfully associated with the disease . This disappointing result raises an important question: if depression is in fact several distinct conditions, as the clinical heterogeneity might suggest, does looking at a large and diverse group of patients hamper our ability to find common risk factors? A breakthrough study from this year suggests this may be the case . Researchers from the CONVERGE consortium decided to limit their genetic analysis of MDD patients in several ways. First, they only studied women of Han Chinese descent, ensuring that the genetic background between patients was very similar. They also restricted their analysis to patients with a profound form of MDD known as melancholia, reasoning that more severe cases would have a less-complex genetic signal. The consortium is the first to successfully identify genetic variants that are associated with MDD. A caveat is that this type of study only associates certain genes with a certain type of MDD, and it remains unclear how these genetic variants might cause depression. Although further work is required to replicate these findings and to interpret their biological significance, this study raises the intriguing possibility that additional genetic associations for MDD may be uncovered by careful selection of relatively homogenous patient populations. Despite our lack of understanding of the causes of depression, we know of a number of medicines that can help alleviate its symptoms. All antidepressant medications affect the levels of neurotransmitters, the molecules neurons use to communicate with one another. The discovery that neurotransmitter modulation results in relief of depressive symptoms was made serendipitously in the 1950s, when the anti-tuberculosis drug iproniazid was found to lift the mood of patients receiving treatment . Iproniazid blocks the activity of proteins that break down certain neurotransmitters called monoamines, such as dopamine and serotonin, resulting in increased levels of these neurotransmitters. Decades of research and pharmaceutical development have yielded the safer, more selective drugs used today; however, these modern drugs appear to act through the same fundamental mechanism of neurotransmitter modulation. Echoing the clinical heterogeneity of MDD, about one-third of patients do not respond to antidepressant medication . The mechanistic link between neurotransmitter modulation and mood remains unknown. Although antidepressant medications change the levels of monoamine neurotransmitters in the brain very rapidly, the patients who feel relief from their symptoms report that these drugs take 4-6 weeks to reach full effect . This delay might reflect the underlying biology of the disease, or it might reflect how treatment response is detected. Much like how depression is diagnosed, the effects of antidepressants are measured by patient self-reporting using standardized questionnaires. Some individuals feel immensely better upon taking antidepressants. However, this evidence is anecdotal, and the efficacy of antidepressant drugs at the population level is contentious. In 2013, researchers pooled the results of all clinical trials on antidepressants submitted to the U.S. Food and Drug Administration (FDA), including unpublished trial data, and found that the medicines were only more effective than placebo control for the most severely depressed patients . Frustratingly, many of the most depressed MDD patients will spend months trying several medications, and a substantial portion will never find an effective antidepressant . While the interpretation of clinical trial results is a complex and sensitive task, it is clear that MDD patients bear a significant disease burden while waiting for antidepressant treatments to work. Fortunately, a new class of antidepressants is poised to change the landscape of MDD treatment. In the early 2000s, researchers at Yale University discovered that low doses of ketamine relieved the symptoms of MDD patients within hours, with sustained benefits lasting a week or more . This finding has since been replicated in several independent reports, including a landmark study at the National Institute of Mental Health (NIMH) in 2006 . Ketamine is a well-known medicine that has been used clinically and recreationally since the 1960s. At very high doses, the drug causes feelings of dissociation from reality and visual hallucinations; nonetheless, ketamine is the anesthetic of choice in the emergency room for children and patients with unknown medical histories since it is otherwise very safe . Unlike all other antidepressant medications, ketamine appears to work by blocking the action of a protein that binds the neurotransmitter glutamate . The U.S. FDA has not approved ketamine for the treatment of depression, and most likely it never will. Such approval requires multi-phase clinical trials that are typically funded by pharmaceutical companies, who have little impetus to invest in a generic drug. There are presently around 30 clinics in the U.S. where MDD patients can be treated with ketamine “off-label,” i.e. without FDA approval and thus without coverage by medical insurance. Critics of these ketamine clinics accuse physicians of extorting desperate patients without knowing the long-term safety profile of the drug . Meanwhile, drug companies are actively developing ketamine derivatives, or compounds with the same activity but a slightly different structure or formulation that allows them to be patented. In 2015, Janssen sought approval for a nasal spray containing a ketamine derivative, and the pharmaceutical giant Allergan acquired Naurex, a company whose main products are two ketamine derivatives in late-stage clinical trials. Once taken to market, these ketamine derivatives are predicted to be instant blockbusters . Although it may not be a profitable drug, the NIMH has recognized the exciting potential of ketamine and is currently conducting dozens of trials on the drug. Because it acts on a different neurotransmitter system and has much faster kinetics than all other antidepressants, scientists hope to use ketamine as a tool to learn about the underlying biology of depression. Unfortunately, and perhaps not surprisingly, some patients do not respond to ketamine treatment . However, patients can be stratified into responders and non-responders within days, as opposed to the weeks required for standard antidepressant therapies, which will hopefully increase the accuracy with which patients are subgrouped. This is turn holds promise to facilitate the search for physiological changes and genetic variations that are associated with distinct forms of depression. Diagnosis of MDD based on clinical symptoms likely groups together distinct conditions under one term and impedes our ability to identify the biological causes of each subtype of disease. Our lack of objective markers to detect depression in turn limits our ability to define the disease by anything other than its symptoms. While medical diagnoses will continue to be based off the Diagnostic and Statistical Manual of Mental Disorders (DSM), the NIMH has recently implemented a new conceptual framework that attempts to break this unproductive cycle. This Research Domain Criteria (RDoC) framework was formally introduced in 2013 and consists of domains representing the major systems of emotion, cognition, motivation, and social behavior. Each domain is subdivided into constructs which are based on our current understandings of behavior-brain relationships and can be measured using molecular, genetic, physiological and/or psychological testing (Figure 2) . Unlike a binary clinical diagnosis which groups all patients together, the RDoC framework enables distinct patterns of symptoms to be described with fine resolution. Patients with an MDD diagnosis may have symptoms in any or all of the RDoC domains, and each domain is scored based on the severity of those symptoms. For example, one patient may not respond appropriately to positive rewards and have difficulty sleeping, while another may experience social withdrawal and anxiety about the future. Stratifying patients into such groups will hopefully enable the discovery of subtype-specific biomarkers and therapies. Initial results using the RDoC framework seem promising. A study completed at Massachusetts General Hospital this year used natural language processing software to analyze existing inpatient psychiatric data. The researchers found that patients’ RDoC scores are a better predictor of the duration of hospital stays and the frequency of readmission than their clinical DSM-based diagnoses . Although its utility remains to be determined, the development of the RDoC framework represents an important rethinking of how we classify mental illnesses. Figure 2: Overview of the RDoC framework . There are currently five domains (boxes) which attempt to capture the breadth of normal and pathological human behaviors. Each domain is subdivided into constructs (select examples listed) which can be measured at the level of genes, molecules, cells, neural circuits, physiology, behaviors, or self-reports. Neuropsychiatric disorders such as MDD are long overdue for the science-driven paradigm shifts that have benefited most other fields of medicine. Emerging research is shedding light on the genetic risk factors for depression as well as providing faster-acting antidepressant therapies. Together with the updated classification of mental disorders provided by the RDoC, these advances offer hope that we might soon move from a symptom-based to a biology-based understanding of neuropsychiatric disease. Emily Ricq is a PhD candidate in Chemistry and Chemical Biology at Harvard University. She researches epigenetic mechanisms in neuropsychiatric disease at Massachusetts General Hospital. Are you aware of any recent studies showing that antidepressants are no more useful to a patient psychiatric conditions that a placebo being administered at 40% efficacy? Recently, I read a statement from a leading psychiatrist who is published, that a landmark study came out recently and 40% of the time antidepressants showed no better results than antidepressants. I’ve tried reaching out to that psychiatrist by mail and Facebook and she hasn’t replied. I’ve searched the internet for this study and cannot find it either.